The Agri-Business Educational Foundation (ABEF) will be hosting a Golf Outing, Tuesday, April 17. Gather your foursome and enjoy a relaxing day of golf before the 2012 Agri-Marketing Conference begins. Signup deadline is April 6th. The Agri-Business Educational Foundation (ABEF) Golf Outing will take place on The Duece Course at The National Golf Club. A chartered bus will leave the hotel at 11:30 a.m. to take everyone to the golf course and a boxed lunch will be provided. Tee time begins at 1:00 p.m. An awards ceremony and reception will cap your day on the greens. Cost for the outing is $150 per golfer. If you need or want to register for the golf outing and for the conference at the same time, please visit http://www.nama.org/ConferenceRegistration/Default.aspx?confid=38. If you’ve already registered for conference but want to add the ABEF Golf Outing, please visit www.nama.org/amc/golfregister.htm. Nearly 30 members of Midlands NAMA gathered at Farm Bureau in Lincoln, NE, in March to hear the latest trends in Digital and Social Media. 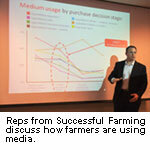 Courtney Yuskis and Eric Marzen, of Successful Farming, shared recent survey results on how farmers are using Media. Market research from two groups of farmers was compiled and shared. The averages of the two groups surveyed in 2011 consisted of farmers who aligned with two sets of demographics: 58 years old with 1,048+ acres and 53 years old with 900 acres. Marzen reported, “Consumers use nine or more sources of media before making purchasing decisions. Farmers are much like other consumers in the fact that they are using more forms of media before making purchasing decisions.” According to the survey, 10% of farmers gather their information from Ag websites, 19% from radio and 39% from magazines. The number of farmers who have adopted high-speed internet has increased to 72% in 2011, an increase of 20% since 2009. As a result of farmers’ remote lifestyle, many have leaped directly to mobile services for high-speed internet. Midlands NAMA members confirmed that they are noticing several trends of their own among their farmer client base. One company recognized a trend that livestock producers have adopted mobile high-speed slightly faster than row crop farmers. Additional members noticed an increase in web traffic via mobile devices this spring compared to historical years when web traffic has slowed down as farmers entered the field. The reason behind these trends: farmers are relying on their mobile devices in the field and around their farm rather than spending time in front of the computer. Smartphone adoption continues to increase, which supported these contributions from members. In September 2010, 10% of farmers used Smartphones. In August 2011, that number increased to 39%. In fact, the survey data shows farmers have surpassed the general public in using Smartphones: 45% farmers compared to 44% general public. Tablet usage has also taken off. From using apps to plugging tablets directly into docking stations in tractors, farmers are using tablets in their day-to-day operation. Marzen reports that 14% of the farmers surveyed currently own and use tablets. What are farmers doing with this technology? Early internet adopters used the internet primarily for weather and market information. Today’s farmers are using mobile media and apps throughout their operation. Common usages include everything from gathering information, evaluating products, joining online discussions to capturing information in their day-to-day operation, determining the best re-implanting dates and measuring crop maturity. The early registration deadline is March 22, 2012. Register today to take advantage of our early registration discount. Download and fill out the registration form and mail, fax or phone it in to the NAMA Office. You may also register on-line at http://www.nama.org/ConferenceRegistration/Default.aspx?confid=38. Please note that the early registration deadline is March 22, 2012. Please note: No “Bill Me’s” will be allowed after March 30, 2012. All “Bill Me’s” will need to be secured with a credit card. The Sheraton Kansas City Hotel at Crown Center (formerly the Hyatt Regency Crown Center) is the hotel for the 2012 Agri-Marketing Conference. Reservations made after this date are subject to higher rates and potential unavailability. Make sure you mention “NAMA” when making reservations. Hurry and make your reservation today before the block fills up! Find a home for that special edition wildlife print or even those sports tickets and surplus company logo jackets. Or give a media package or services, and support the Agri-Business Educational Foundation (ABEF) at the same time. How? By contributing to the annual ABEF Silent Auction. Donations are needed for the ABEF Silent Auction at the 2012 Agri-Marketing Conference in Kansas City. Please join your agri-marketing peers in supporting this worthwhile effort by donating to the auction. Click on the Pledge Form to indicate your donation and/or interest in the project by March 16, 2012, to be included in the auction catalog. The primary goal or mission of the Agri-Business Educational Foundation (ABEF) is to provide today’s agri-business students the tools they will need to succeed tomorrow. Cost for the outing is $150 per golfer. If you need or want to register for the golf outing and for the conference at the same time, please visit http://www.nama.org/ConferenceRegistration/Default.aspx?confid=38. If you’ve already registered for conference but want to add the ABEF Golf outing, please visit, www.nama.org/amc/golfregister.htm. Show your support and sponsor a hole. To sign up for a sponsorship on-line, visit http://www.nama.org/amc/golfsponsor.htm or contact Jenny Pickett at 913-491-6500 or via e-mail at jennyp@nama.org. A tornado warning didn’t stop approximately 70 NAMA and AAEA members from enjoying a reception during Commodity Classic in Nashville last week. Storms blew through the area and forced convention-goers to either stay in the exhibit hall or be herded to another safe zone. After the all-clear signal, NAMA and AAEA members gathered for a joint reception. A big thanks goes to the Great Plains, Rocky Mountain and Midsouth Chapters and also to BASF for helping sponsor the reception. NAMA President Beth Burgy promoted the NAMA national conference April 18-20 in Kansas City and AAEA President Greg Horstmeier helped welcome the group and let everyone know about the May 10 Regional Workshop in Ankeny, Iowa. As you have seen and heard on the news, the recent tornados left a path of destruction, especially across Indiana. This hits especially close to home for Carolinas/Virginia NAMA member and regional director, Ann Camden, who like many of us, was at Commodity Classic when the tornado touched down in Nashville. While Nashville was mostly spared, Ann’s parents’ home and family farm in New Pekin, Indiana was not. “They lost the house, truck, barn and several tractors,” said Ann in an e-mail to fellow C/V NAMA member, Jeff Tennant. “It’s a total loss, but they are physically fine.” Ann’s uncle was at Commodity Classic so she rode with him to Indiana where she is helping her family pick up the pieces. Her parents have found a temporary residence and many in the community are helping them empty out the house and clean up the farm. If you would like to help Ann’s family, they are in need of Wal-Mart gift cards, Kroger gift cards, work clothes, work coats and work gloves. Contact Mary Cameron at Gibbs & Soell (mcameron@gibbs-soell.com, 919-870-5718) to coordinate your donation. If you would like to help others across the Midwest and South who were affected by the tornados, you can also donate to the American Red Cross Disaster Relief. To contribute, go to http://www.redcross.org/, call (800) RED CROSS (800-733-2767) or text the word REDCROSS to 90999 to make a $10 donation. Contributions also may be sent to local Red Cross chapters or to the American Red Cross, P.O. Box 37243, Washington, D.C. 20013. The North Central NAMA Chapter hosted a Networking Event for professionals and students on Feb. 9, 2012. More than 70 students attended this event that involved roundtable discussions and a Career Fair. The evening kicked off with roundtable discussions that included topics helping students prepare to find a job, as well as issues facing communications professionals. Students were able to attend four roundtable discussions during the hour. Following the roundtables, a short career fair was held. Nearly 15 agribusiness companies and agencies were part of the career fair that allowed students to ask more specific questions about opportunities available within the individual organizations. With the success of the first event, organizers are looking ahead to the next event. For more information on future events, contact Becca Yaklich, North Central NAMA Student Liaison Committee Chair, Becca.Yaklich@agribank.com. The February Iowa NAMA meeting was held February 24, with guest Ryan Burchett of Mississippi River Distilling Company speaking to the group about his start-up business in LeClaire, Iowa. Ryan and his brother Garrett decided to take a chance on a dream and start Mississippi River Distilling Company in 2010. Since opening, they have been featured on FoxNews.com and named “Best of What’s New” by Midwest Living Magazine. Ryan explained how they got started and established themselves as a “local” company – with everything from their building to their t-shirts and especially their ingredients coming from local resources. All of the grain for their distillery comes from local farmers, and everything is done under one roof, from raw grain to bottling and hand-marking each bottle. Ryan also discussed their sales and marketing tactics with the group, describing how their Facebook presence and word of mouth have been their main tools since opening. Iowa NAMA members greatly appreciated Ryan taking the time to talk about his local family business; to learn more, please visit the Mississippi River Distilling Company website at www.mrdistilling.com. Midlands NAMA came together for an informative session on Farm Financials 101 this month in Lincoln, Nebraska. Industry experts, Jason Ladman, Director, and Tim Brhel, Ag Finance Specialist, both of Water Street Solutions, discussed the financial environment farmers are facing today. The group learned how farmers leverage their production with insurance, marketing and financial tools to maintain a healthy working capital and equity. They heard case studies of several operations that are successfully using an integrated strategy to manage their farm. What’s driving this need for better financial management? Extremely volatile commodity prices, skyrocketing land values and an unstable global economy are some of the leading factors that cause farmers to hone their financial management skills. According to Brhel, “The key concern is really evaluating the risk bearing ability of each farmer’s unique operation as a whole and then making a decision based on the long-term impact.” When decisions are well planned, farmers are able to do what is right for their operation, improve communication with lenders, suppliers and investors and overall build better business practices.